On my previous post I had mentioned buying another obscure soda that was of the more classic variety-so here it is. Royal Tru-Orange Soda. 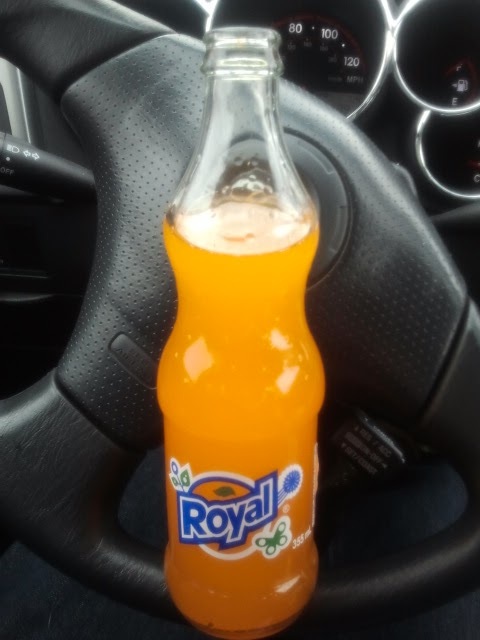 After doing some research(as I tend to do, especially when it concerns foreign-made sodas), I discovered that this drink originated in 1922 in the Philippines and originally included bits of orange pulp-thus the "tru-orange" label. It is also owned by Coca-Cola and features labeling similar to the Fanta line. A quick check of the label confirms it is bottled with cane sugar, and contains 10% juice. Gives you a bit of viramin C as well. The most interesting thing, however, is that it contains something called "ester gum solids". Whenever you make a soda containing oils for flavoring, you need to include some kind of stabilizer. Most sodas in the United States use brominated vegetable oil-and upon further research I found BVO to be dangerous in large amounts(4-8 liters of soda a day). Ester gum solids are the natural alternative, and much safer. I personally noticed a huge difference in mouth feel. Anyways, we finally get to what this soda tastes like. In a word-it's orange-tastic(I didn't say it was going to be a real word). This is hands down the best orange soda I've ever had. I would go so far as to say it is an orange soda that even fruit-flavored soda haters would enjoy. It's crisp, refreshing, and the sweetness is perfectly balanced with the sweetness. Most orange sodas leave you with this melted-popsicle syrupy thickness in your throat along with an oily film on your tongue-not so much here. Somebody did a(non-lemon lime) fruit-soda very, very right for once. It's uninspired and kind of tacky. Granted, it has to compete with some other pretty bright packaging in the Asian market, so I guess it kind of has to be. Smells like a freshly-peeled orange. It loses half a point for not doubling as potpouri as a real orange would. Best orange soda I've ever had. Sweet, tart and slightly sour. Packaging was meh, but the smell, taste and mouth feel were amazing. The ester gum solids should be an across the board replacement for BVO, which doesn't seem too hard a thing when the E.U. doesn't allow BVO and neither does India.